Infinity Blade 2 has received its first title update today, with the game’s developers hoping that they have fixed numerous game-breaking bugs which became apparent after its release just a few days ago. After the first Infinity Blade iOS games stormed to the top of the charts and received critical acclaim it was almost a given that developers Chair would release a second installment, and they have duly delivered. 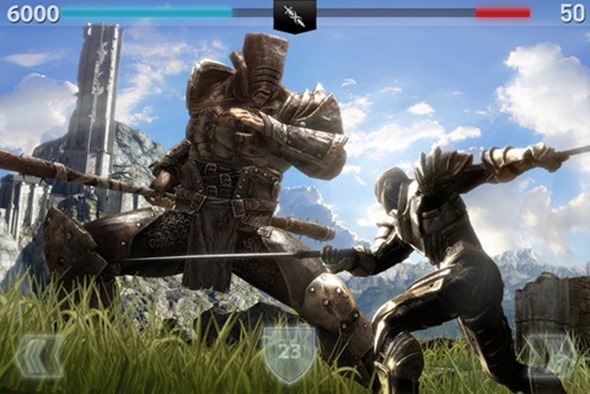 When Infinity Blade 2 went on sale on December the 1st the title was downloaded by mobile gaming fans the world over, each paying the $6.99 price of admission in order to receive both the iPhone/iPod touch and iPad versions of the game. Unfortunately, all was not well as people began to immediately complain that the new game would crash on their iOS device. After some digging around it became clear that the game did not play too well with older hardware, prompting Chair to release a statement confirming that it knew of the problems, and that a fix was in the works. We’ve discovered an issue with some users who are running Infinity Blade II on iPad 1 and iPod touch devices. We are working to have a fix for this issue ASAP. That fix is now available to download for iOS users who already own Infinity Blade 2, with new purchasers obviously receiving the updated version of the game when they purchase it. The update features ‘Balance tweaks, optimizations, and bug fixes’ according to the game’s iTunes App Store page, which we can only assume means they have solved whatever issue was manifesting itself in the ways users of the affected hardware were describing. We’ve not been able to replicate the problems before or after the update, so we are going to rely on your, good reader, to let us know how the update has panned out for you. Get in touch via the usual means of Facebook, Twitter or Google Plus and tell us if you had problems getting Infinity Blade 2 to run before the update, and if you did, whether Chair update has smoothed things over or not. Links to all our social media pages are below!